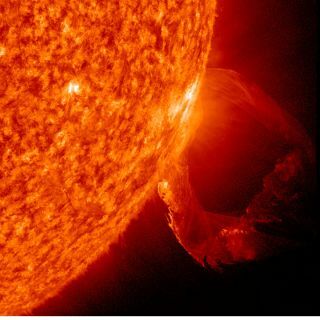 NASA's Solar Dynamics Observatory spacecraft captured this eruption from March 19, 2011 as a prominence became unstable and blasted into space with a distinct twisting motion. After three years in a deep solar sleep of historic proportions, the sun is finally starting to wake up. Sunspots — cooler regions fraught with intense magnetic fields — now regularly dot the surface of the sun, and the star has unleashed several powerful flares in recent months, including a Feb. 14 blast that was the most powerful outburst in more than four years. All signs suggest that the sun has shaken itself out of its slumber, researchers say. In 2008, the sun plunged into its least active state in nearly a century. Sunspots all but vanished, solar flares subsided and the star was eerily quiet. Quiet spells on the sun are nothing new. They come along every 11 years or so, as part of the sun's natural activity cycle. But this latest solar minimum lasted longer than usual, prompting some researchers to wonder if it would ever end. "It's been three long years," Fisher said. That wait appears to be over. Another event on March 7 hurled a billion-ton cloud of charged particles away from the sun at 5 million mph (8 million kph). This blast, known as a coronal mass ejection, wasn't aimed directly at Earth, but it did deliver a glancing blow to our planet's magnetic field. "That was the fastest coronal mass ejection in almost six years," said Angelos Vourlidas of the Naval Research Lab in Washington, D.C. "It reminds me of a similar series of events back in Nov. 1997 that kicked off Solar Cycle 23, the solar cycle before this one. To me, this marks the beginning of Solar Cycle 24." The slow build-up to this moment is more than just "the watched pot failing to boil," said Ron Turner, a space weather analyst at Analytic Services, Inc. "It really has been historically slow." There have been 24 numbered solar cycles since researchers started keeping track of them in the mid-18th century. In an article to appear in the Space Weather Journal, Turner counted up sunspots and determined that only four solar cycles in recorded history have ever started more slowly than this one. "Three of them were in the Dalton Minimum, a period of depressed solar activity in the early 19th century. The fourth was Cycle number 1 itself, around 1755, also a relatively low solar cycle," Turner said. Experts predict solar activity will peak around 2013. So Earth could soon be seeing yet more powerful solar storms, which could mean more stunning auroras as well as some less desirable side effects — the blasts can disrupt satellites and power grids, as well as pose a danger to astronauts on spacecraft.